Neat speakers featured in a What Hi Fi? 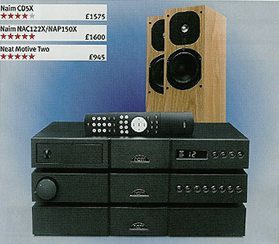 system test this month (using Naim’s entry level pre-power amps and a CD5X cd player), winning 5 stars in the context of an overall 5-star system score. Naim Audio specifically requested Neat loudspeakers for this review and this result again confirms the widely held view that Neat and Naim are a winning combination. Of course, there are other electronics available which also give superb results when partnered with Neat loudspeakers….